Israeli occupation forces (IOF) stormed the municipality building of Taku village in Bethlehem and detained employees in one of the offices at noon Sunday. One of the employees told Quds Press in a telephone contact during the detention that the soldiers arrived in six armored vehicles and encircled the municipality building. He said that the soldiers accompanied by intelligence agents conversed with the municipality chairman and the director. The operation came in line with investigation into the writing of racist slogans on the walls of two mosques in the village by Jewish settlers, who also threatened the municipality chairman. In another Bethlehem village, Ahmed Salah, the coordinator of the popular committee in Al-Khader, said that IOF soldiers served summonses to a number of young men in the village. Israeli navy gunboats fired at Palestinian fishermen while working at sea before dawn Monday and forced them to retreat nearer to the shore. Sources in the Gaza marine police told the PIC reporter that the Israeli gunboats opened machinegun fire intermittently all throughout the dawn hours. They said that the shooting took place in Sudaniya to the northwest of the Strip and off the coast of Gaza city and the central areas of the enclave. The sources pointed out that the fishermen were forced to work only one and a half nautical miles off the coast, adding that no casualties or losses were suffered. Israeli occupation forces (IOF) attacked at dawn Sunday two Palestinian young men in Dura southern al-Khalil. IOF soldiers in an army patrol, stationed at Khursa junction, stopped a Palestinian vehicle and checked the two young men's identities and suddenly attacked them with rifle butts, causing them different injuries, eyewitnesses confirmed. The sources added that the IOF soldiers prevented medical aid to the young men and blocked their transfer to a hospital for treatment. Meanwhile, a number of Palestinian youths threw stones at the soldiers after beating the two citizens as other Israeli forces arrived to the scene but no arrests were reported. Violent clashes took place in Beit Ummar village, north of Al-Khalil, on Saturday after Israeli occupation forces (IOF) stormed the entrance to the village. Eyewitnesses told the PIC that the soldiers fired metal bullets and teargas at young men injuring 11 of them while dozens were treated for breathing problems. They said that the clashes were reported at the main entrance to the village and at its eastern flank, adding that IOF soldiers positioned near the village and reinforcements were sent to the area amidst tightened security measures. 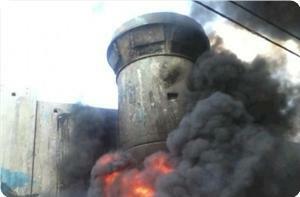 An Israeli military tower overlooking Aida refugee camp in Bethlehem city was burnt in an attack on Saturday evening. Eyewitnesses told Quds Press that the Israeli soldiers fled from the tower after it was attacked with homemade Molotov cocktails by angry Palestinian young men. The attack happened during violent clashes with Israeli soldiers who fired tear gas grenades at the young men. 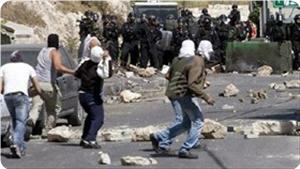 Two young men also suffered bullet injuries in similar clashes that broke out in Al-Khader town west of Bethlehem. Beit Ummar town also saw on the same day violent clashes between young men and soldiers. According to local sources, the Israeli occupation forces brutally raided the town, broke into two houses belonging to Abu Ayyash family and closed the main entrance to the town before clashing with young men. Israeli regime’s spy agency, Mossad, has threatened to assassinate officials of the Palestinian resistance movement, Hamas. Israel Radio quoted a Hamas spokesman as saying that Israel’s spy agency, Mossad, has sent warning messages to Gaza officers and security forces, threatening to assassinate those fighting against the regime. 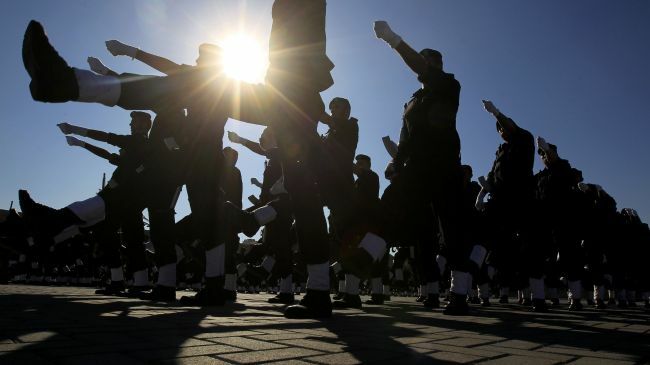 The threats came after Hamas said last week that its security forces arrested a number of people on suspicion of espionage for certain Western and Arab spy agencies in the Gaza Strip. “The Gaza Strip is swarming with Western intelligence agencies, such as the American, British, French and German services,” Lafi said, adding that certain Arab spy agencies were also operating in Gaza. In mid-March, Hamas Interior Ministry warned those spying for the Israeli regime that they would be pursued without mercy if they did not turn themselves in by April 11. 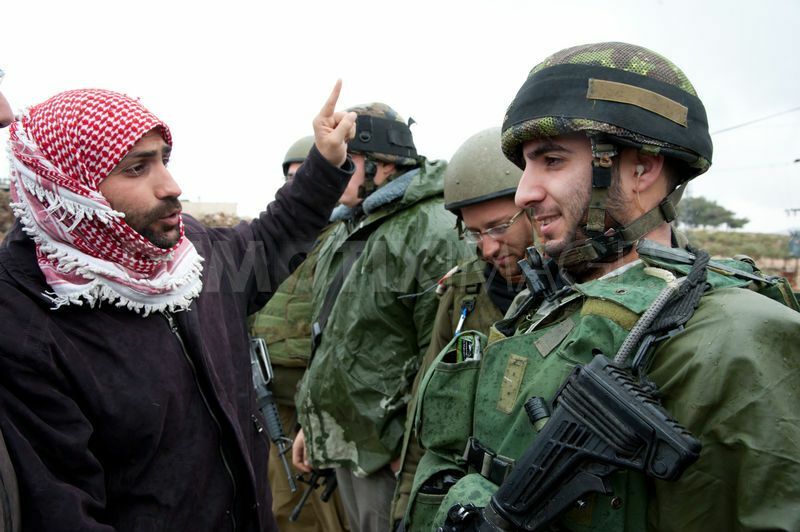 Non-violent protests against the Israeli Wall and settlements were organized in the villages of al Nabi Saleh, Bil’in, Nil’in and Silwad in central West Bank, in addition to Beit Omer and Al Ma’ssara in southern west Bank. In the central West Bank village of Al Nabi Saleh, five local youth and an international supporter, were injured by rubber coated steel bullets fired by Israeli soldiers at the weekly anti wall and settlements protest of Al Nabi saleh village. Villagers and their international supporters marched at the midday prayers towards lands Israeli took over to construct an illegal settlement on. Troops stopped the protest at the village entrance and attacked the unarmed protesters with tear gas and rubber coated steel bullets, later troops invaded the village and attacked residents’ homes with tear gas. Many were treated for the effects of tear gas inhalation. According to a report by the International Solidarity Movement, “As protesters walked chanting and clapping towards a large group of Israeli military personnel and jeeps blocking the road, they were ambushed. Border police officers who had invaded the village shot multiple volleys of rubber coated steel bullets directly at unarmed protesters from a vantage point on top of the hill, as protesters retreated. In the nearby villages of Bil’in and Ni’lin, residents and their international and Israeli supporters managed to reach the wall. Soldiers stationed there fired tear gas and chemical water on protesters. Many were treated for the effects of tear gas inhalation. In Silwad village on Friday, residents protested against the new Israeli settlement on their lands and conducted the midday prayers at lands the settlers plan to take over. After the prayers soldiers attacked protesters with tear gas. Many were treated for the effects of tear gas inhalation on Thursday settlers attacked a farmer from Silwad and injured him, when the villagers objected the attack Israeli soldiers attacked them and one youth was injured during the clashes. In addition to the four villages that organized protests in the central West Bank, protests were also organized in the southern West Bank, in the village of Al Ma’ssara near Bethlehem and in the nearby city of Hebron. In al Ma’ssara village, Israeli troops stopped the villagers and their supporters at village entrance then forced them back using rifle butts and batons, no injuries were reported. Non-violent protests have been organized on a weekly basis in several Palestinian villages since Wall construction began on villagers’ land in 2003. The Israeli occupation forces (IOF) violently attacked Palestinian citizens immediately after they finished their Friday prayers in Silwad village east of Ramallah city. Hundreds of Palestinians from the villages of Silwad, Deir Jarir and Mazra'ah performed the Friday prayers in their lands which the Israeli regime wants to annex to expand Ofra settlement, which was established illegally in the middle of these villages. Later, the IOF stormed Silwad village and used a bulldozer to open the roads which the Palestinian young men closed during the clashes. Such tension took place after Jewish settlers severely beat a Palestinian villager named Ahmed Hamed on Thursday as he was working his land in an area located between Silwad and Deir Jarir. The villager sustained serious wounds in his head and underwent surgery in a local hospital. 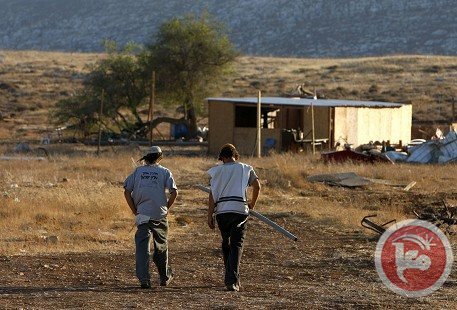 In retaliation to the settlers' attack, angry young men from the Palestinian villages attacked illegal mobile homes that were established by settlers as a point to launch attacks on Palestinian property. The attack on mobile homes triggered overnight clashes with Israeli troops that lasted until midnight and led to the injury of Palestinian citizens, including a 14-year-old child named Hamza Hamed, who suffered serious bullet wounds in his chest and one of his hands. In a separate incident, sporadic clashes erupted on Friday in Al-Khalil city after the IOF attacked a Palestinian march demanding the Israeli regime to open the southern entrance to Al-Khalil city. Eyewitnesses told the Palestinian information center (PIC) that dozens of Palestinians from different areas of Al-Khalil city marched to the southern entrance, which has been closed for 13 years. 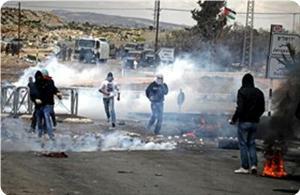 The IOF fired a barrage of tear gas grenades and rubber bullets at the protestors causing many injuries among them. Five young Palestinian men were hurt Friday in clashes with Israeli troops in the central West Bank town of Silwad near Ramallah. A Ma’an reporter said fierce clashes erupted as Israeli forces tried to prevent hundreds of worshippers from performing Friday prayer in the open in private Palestinian lands slated for annexation to the nearby Israeli settlement of Ofra. Despite the presence of Israeli troops, more than 250 worshippers managed to access the agricultural lands and perform Friday prayer. However, after the prayer the soldiers showered the worshippers with tear gas, stun grenades and rubber-coated bullets. Young worshippers responded by hurling stones and empty bottles at the Israeli soldiers who chased them across the town’s alleys. 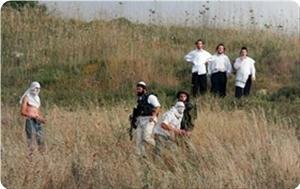 On Thursday, a group of Israeli settlers assaulted a resident of Silwad who sustained bruises and was hospitalized. In response, residents set fire to movable settler houses in a nearby outpost. Heavily armed Jewish settlers went on the rampage in Orif village, south of Nablus, under Israeli military protection on Friday night. Local sources said that the settlers, guarded by Israeli occupation forces, attacked citizens’ homes and property to the east of the village and damaged olive and almond saplings that were planted by the villagers only a month ago. They explained that a number of institutions in the village had organized a day for volunteers in which they planted those saplings. They said that the soldiers attacked the citizens who tried to stop the attack and fired flare bombs and teargas grenades at them. 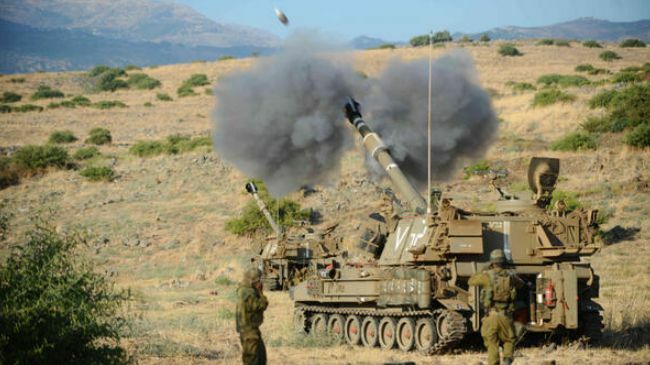 Israeli military forces have fired artillery shells into the Syrian side of the Golan Heights in the latest of a series of shooting incidents on the strategic plateau. 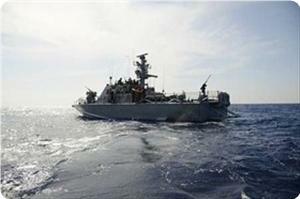 In a statement issued on Friday, the Israeli military said it had fired artillery into Syria. There were no immediate reports of casualties on the Syrian side. Clashes between Syrian forces and foreign-sponsored militants have spiked dramatically in the Golan Heights over the recent weeks. The Israeli military has set up a “military field hospital” at military outpost 105 in the occupied Golan Heights to treat wounded militants fighting against the government in neighboring Syria. Israel launched an airstrike on a research center near the Syrian capital Damascus earlier this year. The Syrian Army said in a statement on January 30 that two people were killed and five others injured in the Israeli airstrike in Jamraya, located 25 kilometers (15 miles) northwest of Damascus. On January 31, the Lebanese resistance movement Hezbollah condemned the Israeli attack as “barbaric aggression”. Israeli settlers on Thursday assaulted a 60-year-old Palestinian judge as he worked on his land near Ramallah, sparking violent clashes between Palestinians and Israeli forces. Judge Ahmad al-Zir sustained multiple injuries, including head wounds, and was left unconscious in the attack, a Ma'an reporter said. He was taken to the Ramallah Governmental Hospital. Residents of Silwad headed to the al-Asour area, where the attack happened, and confronted settlers, setting fire to caravans in a nearby outpost. Israeli forces arrived and fired tear gas and plastic-coated bullets at the Palestinians. A 16-year-old Palestinian was shot in the chest and the arm with plastic-coated bullets, medics said. The teenager was also taken to the Ramallah Governmental Hospital and is in a stable condition. An Israeli military spokeswoman said forces fired riot dispersal means in response to clashes between Palestinians and Israeli civilians in the area of Silwad. "The clash included rock throwing. Palestinians set fire to land that belonged to the Israeli civilians as well as to a caravan," she told Ma'an. Several Palestinian groups announced they would hold Friday prayers at the outpost, which is built on lands belonging to Palestinians in Silwad and Deir Jarir. 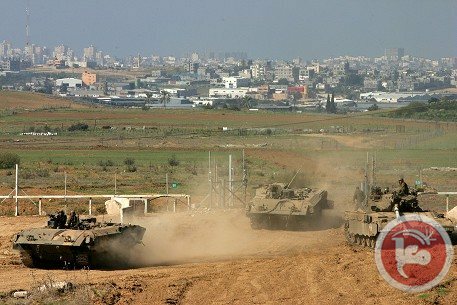 Israeli occupation forces (IOF) opened heavy machinegun fire at residential quarters and farmland to the east of Khan Younis, south of the Gaza Strip, on Friday morning. Local sources told the PIC reporter that the shooting focused on the eastern outskirts of Qarara town and Zanna area to the east of Khan Younis city. They said that the soldiers on board military jeeps opened fire at those areas and on agricultural land near them, but no casualties were reported. 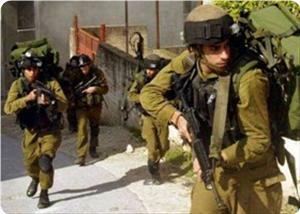 The IOF raided the same area on Thursday in the third such incursion over the past three days. Israeli forces on Thursday shot and injured a disabled Palestinian man in the southern West Bank city of Hebron in an act the Israeli army described as defensive. Motaz Faraj Ibedo, who was already confined to a wheelchair after a shooting two years earlier, was critically injured and transferred to an Israeli hospital for treatment, the Palestinian Prisoners Society said in a statement. An Israeli army spokeswoman confirmed that a Palestinian man was hospitalized after being shot during an arrest operation. She said a soldier fired at the man when he tried to steal a weapon. She said he threw objects including a gas can at soldiers. Two were injured, she said. Amjad al-Najjar, the director of the PPS office in Hebron, denounced the arrest raid targeting a man who is already unable to walk without assistance. Al-Najjar said that the Israeli authorities were responsible for Ibedo's life. He called on the Israeli side to allow the man's family and lawyer to visit him in custody. An army spokeswoman denied Ibedo was under arrest and said he was still undergoing treatment in hospital. Ibedo has been unable to walk on his own since he was shot in 2011 with a so-called dum dum bullet to the abdomen, which ruptured several internal organs and left him permanently disabled. Since that incident, which Ibedo said happened while he was already in custody, he has not been able to walk due to a paralyzed left leg. Israeli Occupation Forces (IOF) shot Mo'taz Obeidu, a physically disabled person, from the city of al-Khalil during his arrest on Thursday, Palestinian human rights sources reported. Israeli sources claimed that Obeidu, 32, attempted to take one of the soldiers' weapons during the arrest. The soldiers fired at him and he was seriously injured and transferred to an Israeli hospital, The Palestinian Prisoners' Society (PPS) said. The PPS held the occupation fully responsible for Obeidu's life, whose health condition is very critical. 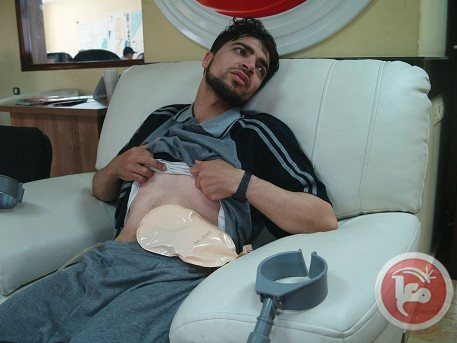 "He uses a urinary drainage bag at all times and was shot in his left leg by Israeli soldiers when he was arrested two years ago, which led to paralyzing his leg." A large military force surrounded Obeidu's shop, stripped him totally and left him outside in the cold weather before arresting him, according to his father. Obeidu, a father of three, was detained on several occasions, including his latest administrative arrest when he spent two years in jail without charge or trial. Israeli soldiers kidnapped former political prisoner, Mo’taz Obeido, 32, from Hebron city, in the southern part of the occupied West Bank. Obeido suffered a disability after being shot by the army in November of 2011. 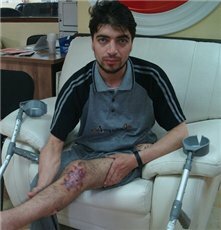 Back in 2011 Obeido was shot by the soldiers leading to paralysis in his left leg, in addition to suffering extensive damage to his stomach and intestines after the soldiers fired an international-banned dumdum bullet at him from a distance that does not exceed 5 meters. His father said that a large military force surrounded his son’s store in Wad Al-Harya area, in Hebron, and kidnapped him after forcing him to remove his clothes. He added that soldiers also fired several rounds of live ammunition during the attack, and that several blood stains were found on the ground after the soldiers left the area, an issue that raises fears among the family that Obeido might have been injured again. 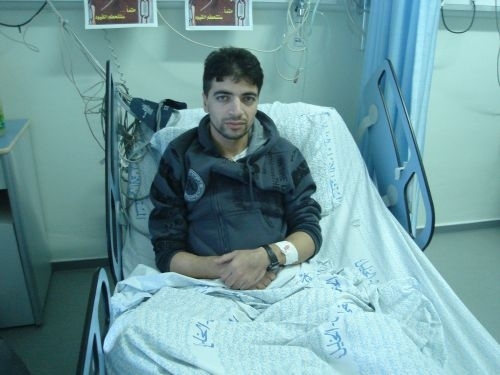 The Hebron office of the Palestinian Prisoner Society (PPS) held Israel fully responsible for the life of Obeido. Amjad An-Najjar, head of the Hebron branch of the PPS, said that Obeido requires ongoing medical attention and follow-up due to his previous injuries, and that he is a married father of three daughters, and was repeatedly kidnapped and imprisoned by Israel, including being imprisoned for two years without charges. Israeli occupation forces (IOF) stormed the Aroub refugee camp, north of Al-Khalil, on Thursday and clashed with protesting youths. Local sources said that the soldiers burst into a number of homes near to the camp’s entrance and into nearby suburbs in Al-Khalil city. They said that young men threw stones and empty bottles at the soldiers who fired stun grenades and teargas bombs on the young men and houses. Israeli occupation forces (IOF) advanced a few hundred yards in southern Gaza Strip on Thursday afternoon amidst firing of smoke bombs. A field observer told Quds Press that IOF soldiers mounting a number of army jeeps and two tanks escorted four bulldozers into eastern Khan Younis. The raid is the latest series of violations of the calm agreement in Gaza on the part of the IOF since its signing last November that killed four Palestinians and wounded dozens in addition to the arrest of 40 fishermen. The Israeli occupation forces (IOF) arrested at dawn Thursday 16 citizens from different parts in the occupied West Bank, and raided a number of houses. Large number of Israeli soldiers and military vehicles raided and searched houses in Aida refugee camp in the south of Bethlehem, southern the occupied West Bank, and arrested two young men in their twenties. 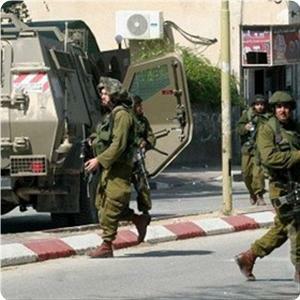 Local sources reported that the detainees were transferred to Etzion detention center in Bethlehem. The Aida refugee camp has witnessed on Wednesday evening violent clashes, during which two young men were wounded by rubber bullets while a number of other citizens suffered suffocation. In al-Khalil, in the south of the occupied West Bank, the IOF arrested on Thursday morning the disabled liberated prisoner Moataz Abido, 32, during raid into his shop, only one month after his release from the Israeli jails. The captive's father told PIC's reporter that shots were heard during the arrest of his son, and that he found traces of blood on the ground after his son was detained. Abido family expressed concern that Moataz might have been shot during his arrest. It also held the occupation full responsibility for the patient captive, who suffers from a very difficult health condition. Prisoner Moataz Abido has been arrested several times before. He had been also held under administrative detention for two years with no trial. The occupation troops arrested last night in Qalqiliya governorate two students at An-Najah National University, after raiding and searching their homes. They both are former detainees in the PA's jails. In Tulkarem, the IOF arrested on Thursday morning a 20-year-old man after raiding his home and transferred him to an unknown destination. 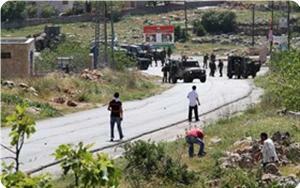 Ten youths have also been arrested in the village of Burin, south of Nablus, during raids into a number of houses. 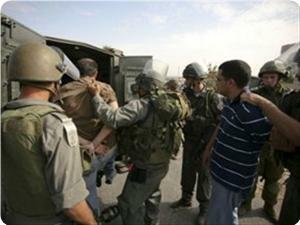 The IOF released 6 of the detainees before leaving the village at five in the morning. Meanwhile; the Israeli soldiers raided at dawn Thursday several neighborhoods in the city of al-Khalil and its surroundings. Eyewitnesses told PIC that large number of soldiers and military vehicles broke into the neighborhood of Nimra, the area of Wadi al-Harya and the Salam Street, and then stationed near the area of Ras al-Jura and at the northern entrance to the al-Khalil city. The witnesses added that the military patrols were deployed on the road between al-Khalil and Bethlehem, where the soldiers stopped and searched some vehicles. No arrests have been reported. Reporters without Borders Thursday strongly condemned the action of an Israeli soldier who deliberately shot a Palestinian photographer in the face with a rubber-coated steel bullet during an incursion by the Israeli forces into the Aida refugee camp, north of the West Bank city of Bethlehem, on April 8. Mohamed Al-Azza, a photographer for Palestine News Network (PNN), was taking photos of the Israeli soldiers from the Lajee Centre, a children’s educational centre inside the camp when he was shot by the soldier. 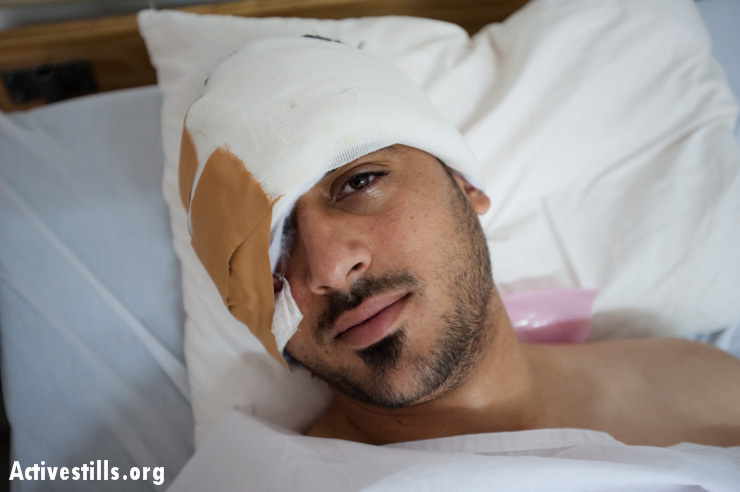 Azza was taken to Beit Jala hospital after being hit in the right cheekbone by the bullet where he underwent an operation. He is expected to remain in the hospital for about 10 days. Reporters without Borders urged the Israeli forces to investigate this deliberate shooting. The soldier who fired the shot should be severely punished. The complete impunity enjoyed by Israeli forces soldiers responsible for violence against journalists must end, said the statement. “At a certain point, I went inside but continued taking photos through a window and a half-open door. That is when I was hit in the face. A friend who was there helped me down but when we wanted to leave the building, the soldiers opened fire on the door again. My friend shouted to the soldiers that I was badly injured and needed to be taken to hospital. When they saw the blood on my face, they let us pass,” he added. 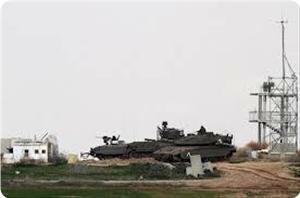 Israeli tanks penetrated onto lands east of Khan Younis in the southern Gaza Strip on Thursday, a Ma'an correspondent said. The tanks were seen about 150 meters over the border line close to the Kerem Shalom crossing. The tanks were believed to be escorting bulldozers performing construction at the border line near a military access gate.